Following on from the last few posts which have been based on the wild coastline and white surf of the North Coast, this post will shift focus from sea level to the craggy peaks of the Mourne Mountains! Starting from the dunes at Murlough Bay, we drove through hail around to the back of the Mournes where we broke through into the sunshine. Walking up Slieve Loughshannagh provided an excellent view across the inner mountains, Lough Shannagh and Silent Valley. 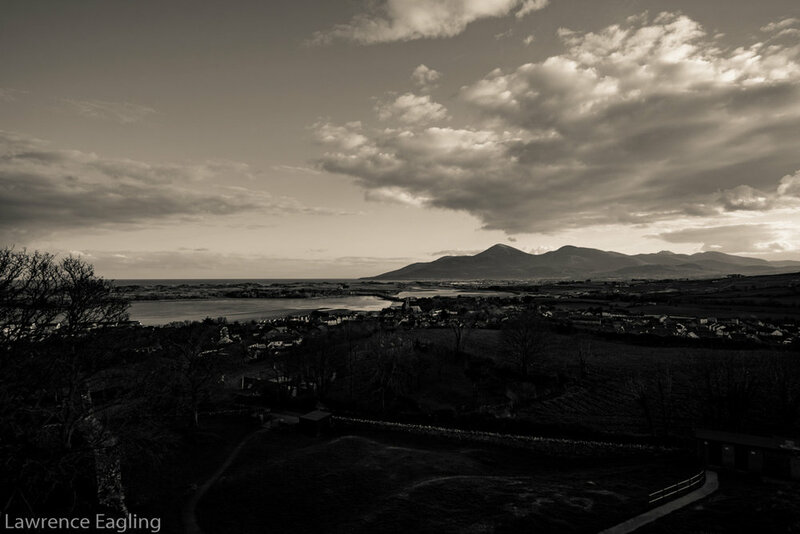 After a short break at the fantastic Maud’s cafe in Newcastle we visited the remains of Dundrum Castle for great views of the mountains in the setting sun. I have never really produced many photos in black and white; however, I felt that it would provide more of a challenge to select shots with sufficient texture to really shine without colour. This would also ensure that I learn more about Adobe Lightroom to produce the best black and white photos. I hope you like my selection from the trip and if you have any advice or comments about this process in Lightroom please get in touch. Alternatively if you would like prints of any of my photos please also contact me via one of the following methods; email at lawrence@eaglingphotography.co.uk, Instagram @lawrence_eagling or twitter @LawrenceEagling.